Not a chef? That doesn’t matter. KitchenAid appliances will slip in to your kitchen as though they have always been there, and suddenly all of your previously time-consuming kitchen preparation tasks will become a thing of the past. Whether it’s a blender, a mixer or a food processor, KitchenAid will blow you away. But now it’s time to welcome a newcomer to the scene. Boasting brilliant modern colours, the Artisan KSM160 Stand Mixer is also equipped with an additional bowl attachment, taking its total capacity to over seven and a half litres – that’s a lot of cookie dough! 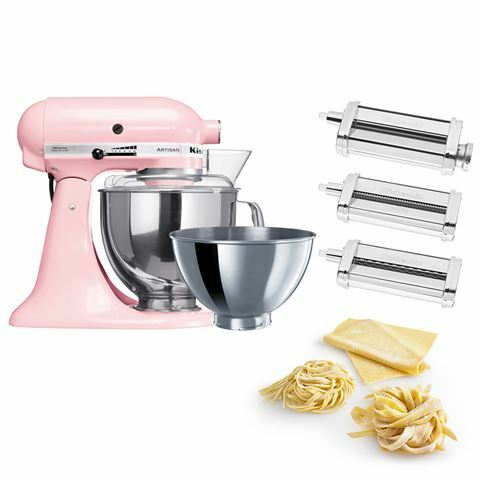 With a powerful motor, exceptional planetary mixing action that gets to the very side of the bowl, dozens of attachments and of course that retro-looking die-cast metal construction, this is the one appliance that every house in the country should own. Hands down. Powerful 300 watt motor with direct drive transmission. Mixing capacity (with yeast dough) up to a mixed weight of 1.15kg. Includes various attachments to get the very best out of your KitchenAid mixer. Also includes a BONUS 3-Piece Pasta Roller Set (5KSMPRA) valued at $289 RRP – Available until 12th May 2019 OR while stocks last. 4.8 Litre Stainless Steel Bowl. 2.8 Litre Stainless Steel Bowl. BONUS 3-Piece Pasta Roller Set - Pasta Roller, Spaghetti Cutter and Fettuccine Cutter. Dimensions: 36cm (l) x 35.5cm (h) x 22cm (w).